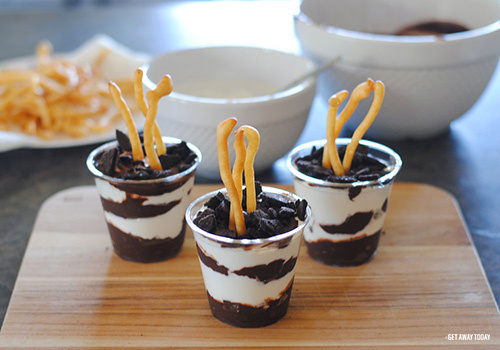 These copycat Disneyland pudding cups will be the hit of any Guardians of the Galaxy event! They are delicious and look the part. 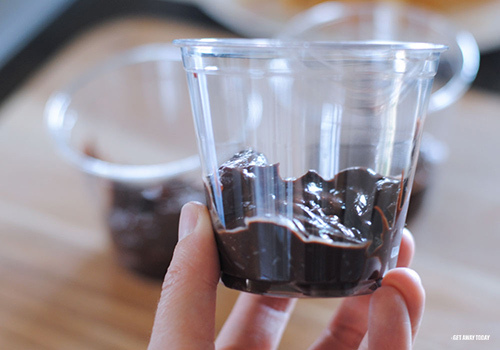 Start by making some simple instant chocolate pudding. I went with the Hershey’s flavor. Once it is all mixes up, put the pudding in the fridge to chill. While your pudding is setting, it is time to make whipped cream. It is fun to make your own! And it truthfully tastes so much better. Use 1 cup of cream, 1 tablespoon sugar and 1 teaspoon of vanilla. 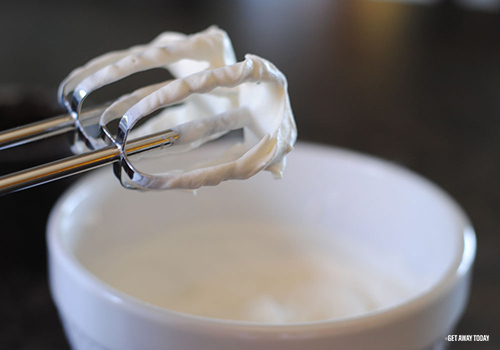 Place it in a bowl and beat it with the mixer until the cream is thick. Do not over beat it, or you will have butter. Place the whipped cream in the fridge. 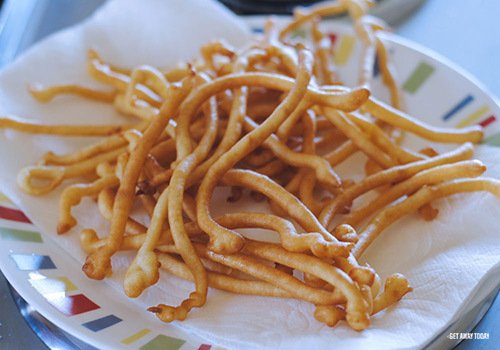 I tried something totally new in making the funnel cake fries. So if it seems daunting, don’t worry! It is a super simple recipe. 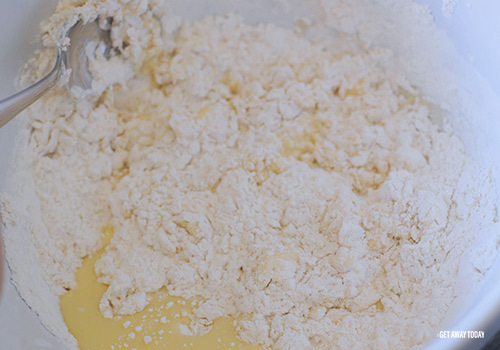 Mix the flour, baking powder and salt together in a bowl. 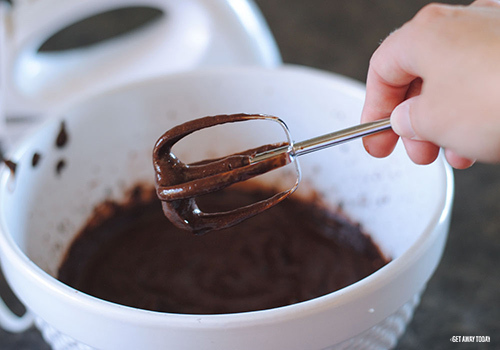 Whisk them so they are combined completely and set them aside. In a separate bowl combine the egg, sugar, milk and vanilla. Beat them until the mixture is foamy and bubbly. Then, carefully add the flour mixture to the wet ingredients and combine them together with a spoon. The batter should be smooth and thick. Not as thick as bread dough, but not runny either. Kind of in between, like waffle mix! 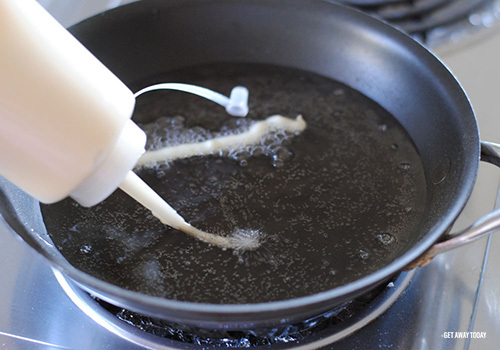 Place the oil into a frying pan and warm it up on the medium heat setting. You want the oil to be at least one inch deep. Frying temperature is about 350 degrees. If you don’t have a kitchen thermometer, then you can do a temperature check by adding a small bit of batter to the oil. If it bubbles up quickly and floats to the top of the pan, the oil is ready. If it starts to smoke and burn, the temperature is too hot. If the batter sinks to the bottom and tiny bubbles appear, wait a few more minutes for the oil to heat up. Our Angry Little Groot Pudding Cups wouldn’t be complete without Groot! 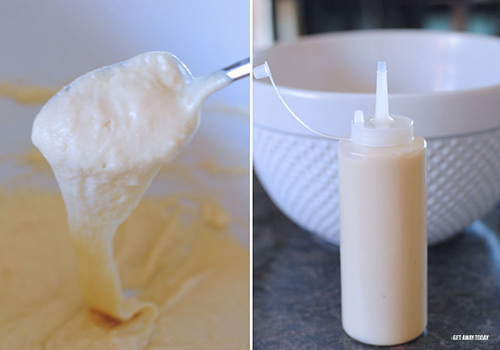 You make Groot by placing the batter into a squeezable plastic condiment container. 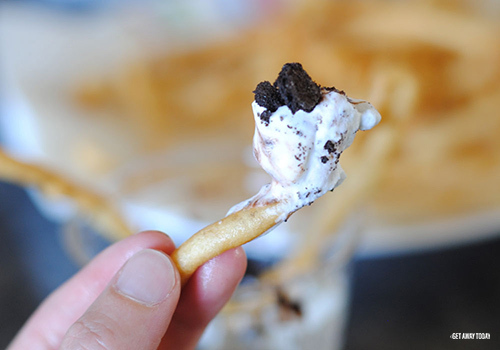 The small hole makes pouring and shaping the funnel cake fries really simple! Squeeze a line of batter into the hot oil. They really don’t have to be perfectly straight. Groot isn’t a stick! He bends and moves. I could only manage about four funnel cake fries at a time in the pan. Any more caused over crowding. It takes only about 30 to 40 seconds for the fries to cook on the first side. Once they start to turn golden brown, turn them over with tongs. Let the second side get nice and golden brown and then remove them from the oil onto a plate covered with a paper towel. The towel will catch and absorb any excess oil. 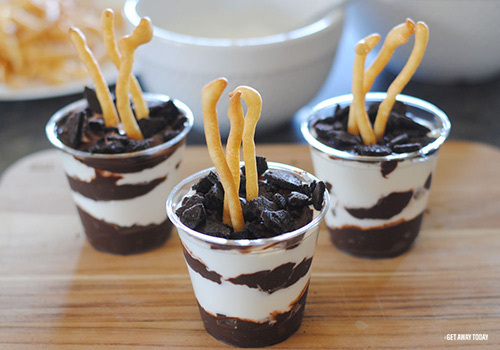 It is time to assemble your Groot Pudding Cups. 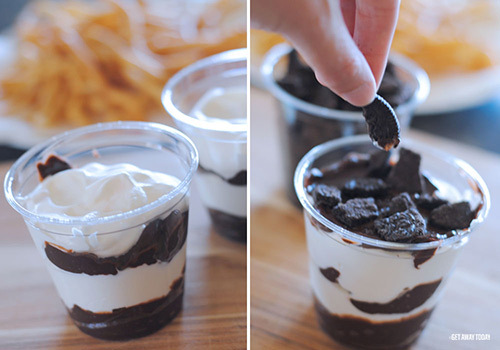 Start with a layer of pudding in each cup. 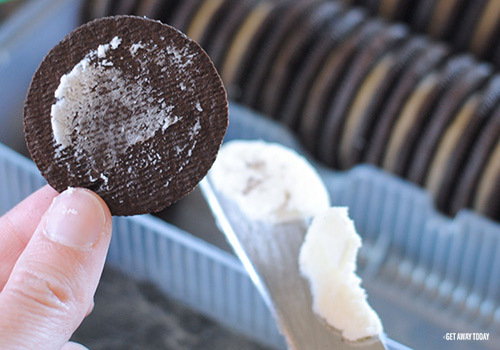 Add a layer of cream next. Repeat the steps until the cup is filled to the top. Then sprinkle some crushed cookies along the top layer. Place a few fries in the top. Now you have your very own Groot Pudding Cups! You will be surprised how tasty the funnel cake fries are. The recipe makes plenty of extra for you to dip in the pudding. All that is left is to enjoy your Groot Pudding Cups! Now you need to go try the original Groot Pudding Cups at Summer of Heroes in Disney California Adventure. Through September 10th, you can find this sweet treat at Award Wieners in Hollywood Land. And don’t forget the other amazing treats scattered throughout, super hero meet and greets, dance parties and so much more only at Summer of Heroes! Book your Disneyland package with Get Away Today online or call our travel experts at 855-GET-AWAY. Don’t forget to use promo code: OSSS15 when booking to save an extra $10 off your already discounted Disneyland vacation!